While we are still trying to calm down from the excitement of the 2014 Chevrolet Camaro Z/28 debut, it is important to remember that the original Camaro news was the exterior refresh so to reflect a bit on the non-Z/28 related changes for the 2014 model year, we present to you the 2014 Camaro SS. When General Motors chose to publically unveil the refreshed 2014 Chevrolet Camaro SS yesterday afternoon on the housewife-favorite Live with Kelly and Michael, we questioned why they would waste such a massive debut on a viewing crowd that likely spends far more time in a minivan than a muscle car. We have since learned that the 2014 Camaro SS was far from the big news from Chevrolet at the 2013 New York International Auto Show but that doesn’t make the changes made to the Camaro Super Sport any less significant as these changes will be reflected across the entire lineup. While the Z/28 information will be more of the stuff that dreams are made of, the changes made to the Camaro SS will be enjoyed by all of the 2014 Camaro buyers. In case you missed our piece on the new Z/28, click here! As we learned with the help of former New York Giants sack monster Michael Strahan (click here for more on that) during mindless daytime television, the 2014 Chevrolet Camaro SS wears a new lower front fascia with a large central air opening and a set of square-ish fog light bezels. This ZL1-esque front end gives the new Camaro a much wider, more aggressive looking stance that is a nice improvement over the smaller lower opening and circular fog light housings of the current (2013) Camaro SS. The upper portion of the front end has also been revamped with a much narrower opening for both the projection headlights and the upper air intake opening – with a new filler used to complete this new upper grille. Finally, the front end of the 2014 Camaro SS benefits from a new hood that is the same basic shape as the 2013 Camaro SS but the inclusion of a new contrasting heat extraction vent helps to keep the engine cool and to improve aerodynamics. “The 2014 Camaro is our opportunity to apply what we have learned listening to our customers, and our continuing development of high-performance models,” said Tom Peters, Camaro exterior design director. “We look for solutions that are both functional and beautiful so that the result is genuine Chevrolet – simple, powerful, honest, and more than expected.”We learned all of this information on the 2014 Chevrolet Camaro SS yesterday at Live with Kelly and Michael were kind enough to post one of the pictures now included in the gallery on the right, showing the front end. However, there were no rear end shots included on their show website so only those who managed to sit through that program got to see the new back end. The refreshed 2014 Camaro rear end begins with a new lower diffuser in contrasting black which travels further up the rear end than the current model with new polished exhaust tips poking through this new fascia. 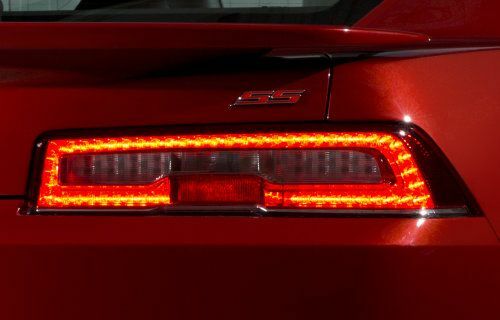 More importantly, the 2014 Camaro now has new taillights across the entire lineup that call upon a single lens setup on each side of the back end – marking the first time in Camaro history where the high performance Chevy muscle car does not have dual taillights. These new lights are similar in the basic design to those found on the current European Camaro along with the Hot Wheels Camaro Concept that debuted two years ago at SEMA. Those lights had a slightly different shape but with the reverse indicators integrated into these new taillights, the Camaro has a taillight design similar to those models sold in Europe. I speculated almost a year ago that General Motors would shift to a single, European style taillight for the US market in an effort to make the car similar in all markets and when I did – people posted nasty comments about how I didn’t know what I was talking about. Now that the 2014 Camaro has hit the stage with taillights more like those on the European models, this writer is more than a little smug at the fact that I called it right while the enthusiast community was off base with their trash talk and predictions of what “would never happen”. As I guessed back in June of 2012, the 2014 Camaro does indeed have rectangular, single unit taillights on each side and I think that they look great while the removal of the backup lights from the middle of the rear fascia gives the new Camaro rump a much cleaner look.